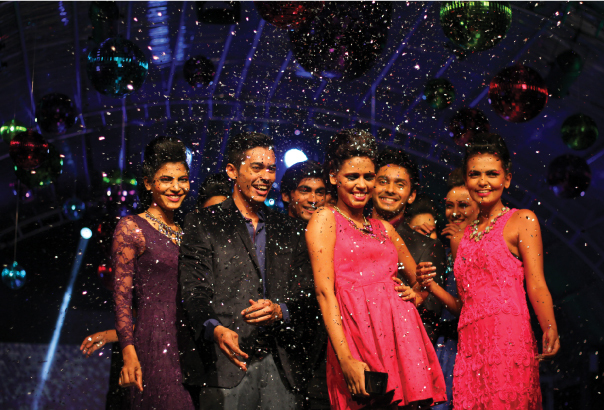 Love and light were in abundant evidence when Sri Lanka’s best loved department store Odel literally switched on for Christmas 2014 in scintillating style at its flagship edifice at Alexandra Place, on Saturday 15th November. A twelve-foot Christmas tree decked in myriad twinkling lights now welcomes visitors at the store’s ‘Boulevard’ entrance in an early reminder that the festive season will soon be upon us, and giving shoppers an inkling of the fairyland transformation that awaits them inside. Perfectly synced with Odel’s theme of ‘Love & Light’ for this year’s edition of its annual Yuletide makeover, the exterior décor and the Christmas tree were formally switched on by one of the store’s premier loyalty customers to the soulful sounds of Voice Print at the formal unveiling of the Christmas makeover, setting off a chain of events that included a guided tour of the store for media and a glamorous fashion show. “Odel is an important new member of the Softlogic Group, and we have extensive plans for the brand and the retail chain,” Odel and Softlogic Group Chairman Ashok Pathirage said. “Since Christmas symbolises a new beginning, it is fitting that this exciting makeover, which caters to the many thousands of Odel shoppers, is the first major event since the acquisition of the brand by Softlogic.” The sparkling seasonal transformation of Odel’s flagship store is manifest in three principal colours, Blue, Purple and Green in rich jewel tones, and uses mirror balls, Christmas trees and bright stars that evoke the traditional imagery of the festive season. The Alexandra Place roundabout has also sprouted Christmas trees in a synchronous celebration of the store’s theme. In store exclusively for the festive season are the latest Fall/Winter styles for women in gloomy florals, burgundy and winter classics for the perfect evening look, complemented by statement-piece accessories in the theme colours. For men, the emphasis is on dark solids, sheen and texture, and the washed out look for casual wear. The arrival of new brands such as Arrow, Utopia and Fellini Fest makes a seasonal visit a must for the fashion-conscious. As always, Odel’s ‘Christmas Specials’ encompass all the traditional requirements, from Gift vouchers with discounts for corporate purchases; Breudher, Christmas cupcakes, Christmas cake, love cake, Gingerbread men, cookies and many more Christmas classics at Delight; a facility to assemble one’s own hampers and have them delivered to the recipients, and a Home Department overflowing with Christmas décor. Visitors to Odel in December can also shop for longer, with the Alexandra Place store staying open till 10 pm from 1st to 19th December, and till 11 pm from 20th to 24th December. All other Odel stores in Sri Lanka will remain open till 9pm from 1st to 14th December and till 10 pm from 15th to 24th December. At the fashion show that followed the unveiling of Odel’s Christmas makeover, some of the latest arrivals for the festive season were displayed on the catwalk in three segments: Burgundy, Winter Classics and Love & Light, providing an insight in to what is going to be ‘in’ this festive season. Pictured here are some of highlights of the fashion show and the seasonal makeover of Odel’s Alexandra Place store.